Last weekend, we spent an incredible evening, in an intimate setting, eating a meal prepared right in front of us, by a Michelin starred chef, as the sun set over Brussels – All while hanging suspended from a crane at Dinner in the Sky. 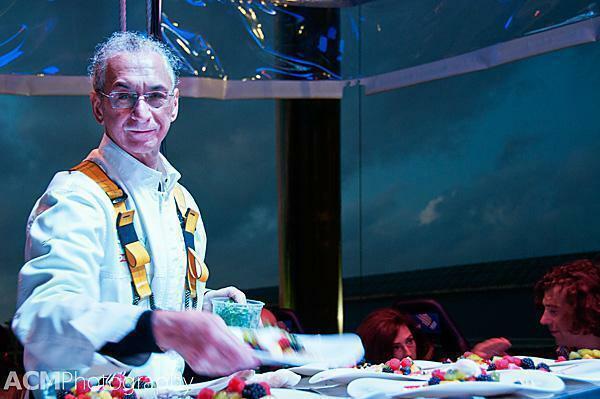 When I first heard about Dinner in the Sky, I wasn’t eagerly awaiting tickets. 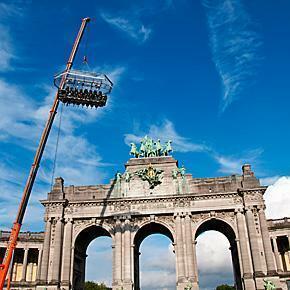 As someone who suffers from a fear of heights, the thought of eating a meal while swinging high above Parc Cinquantenaire and paying a small fortune for the ‘honour’ didn’t appeal to me. 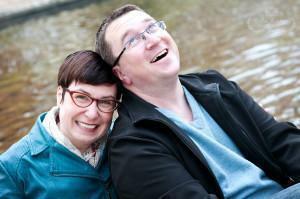 Luckily, Andrew talked me into it (and made sure I had an ample supply of champagne to boost my Dutch courage). 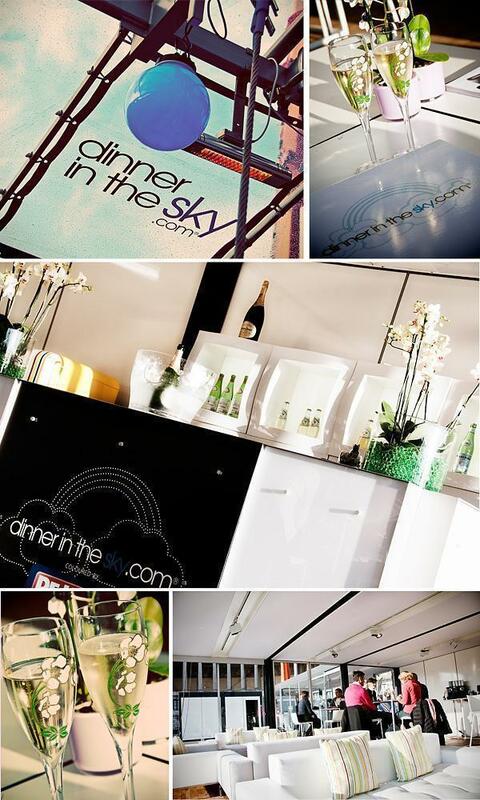 The weather is an important factor in the Dinner in the Sky experience. I had been watching the forecast all week and things weren’t looking good for our Sunday night meal. If it rained, we would spend our meal covered by plastic sheeting – not good for photo ops. If it was too windy, we wouldn’t even leave the ground. There are no refunds due to weather. Sunday morning dawned with both torrential rain and blustering wind. I was resigned to writing off €500 for a meal I could have enjoyed in a warm, dry restaurant for a fraction of the cost. But someone was looking out for us and just as we headed for the metro, the clouds began to part. By the time we arrived at Parc Cinquantenaire the skies were blue and clear. Could we ask for clearer skies? I don’t think so. Looking up (way, way, up) at the diners before us was making me nervous, so Andrew herded me inside the Dinner in the Sky lounge and the server kept my champagne glass topped up. While we waited with our 20 fellow diners, the amuse bouche portion of our meal began. The Dinner in the Sky lounge with plenty of “Dutch courage” for me! Our first mouthful was a cherry tomato with a light caramel and salt coating. It was an odd yet delicious contrast of salty and sweet which exploded in our mouths. This was followed by a green asparagus mousse with puffed rice, which was smooth and fresh. Finally, we had a rich and creamy soup of parsnip and Jerusalem artichoke. Our mouths were ‘amused’ by these little nibbles. By this point, the diners before us had descended to the ground and the staff began clearing and resetting our ‘table.’ When they were almost ready, we were called one by one and helped into our seats. 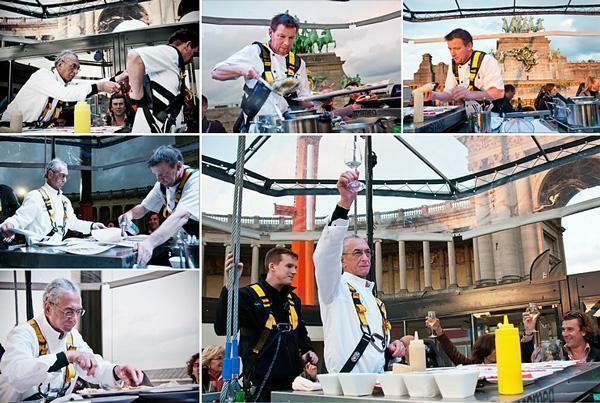 The Dinner in the Sky ‘restaurant’ is essentially a mini kitchen surrounded by a counter and 22 seats. Up to five people can work in the centre kitchen area while diners are strapped into the chairs with harnesses, around the outside. The seats pivot from side to side so you can turn partway around to admire the view behind you. As we were seated, we met our chef and guide on our culinary adventure, Luigi Ciciriello, the master behind La Truffe Noire. Right away, he welcomed us as he laughed and smiled and made each guest feel at home. Chef Luigi Ciciriello toasts our culinary adventure and once he and his head chef are clipped in, they set to work. 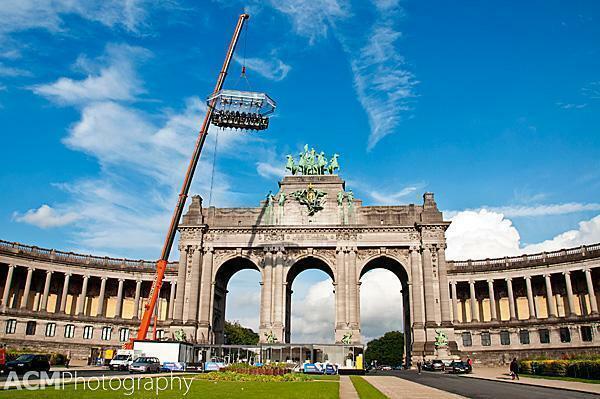 When we were all strapped in, our table started to rise slowly into the sky, until it was level with the top of the Parc Cinquantenaire arch. I snapped photos furiously to distract myself from the height. In fact, the only time I felt slightly uneasy is when I looked straight down. The restaurant does rotate slightly in the wind, but honestly I was enjoying myself too much to be worried – I expect the champagne helped. A lot. 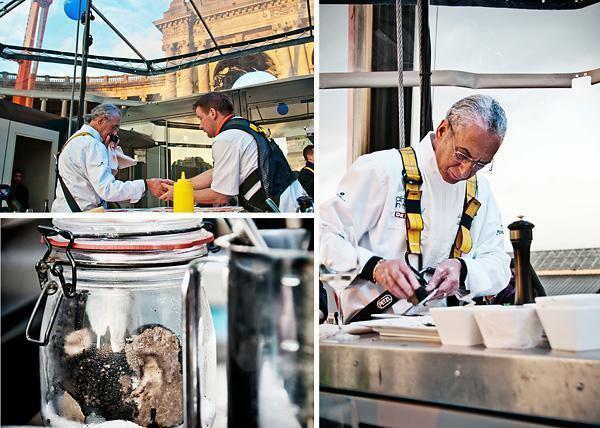 One of the highlights of the Dinner in the Sky experience is being so close to these master chefs, while they work. Chef Ciciriello and his head chef worked so well together, it was like an elaborate dance. Watching them was fascinating. La Truffe Noire isn’t merely a name. In fact, the first thing I saw in the kitchen was a jar of the biggest truffles I’ve ever seen. They featured prominently in our two main dishes. Chef Luigi Ciciriello sniffs and selects the best truffles and then adds generous shavings to our first course. As Chef Ciciriello handed me my Carpaccio of ‘Blue de Prés’ in the fashion of ‘Luigi à la Truffe d’été’, he waved his hand from the plate to his nose and said “first we must taste with our nose.” He was right; the earthy smell of the truffles was heavenly. The thinly sliced beef melted in our mouths and the truffle shavings were set off by the slices of parmesan. 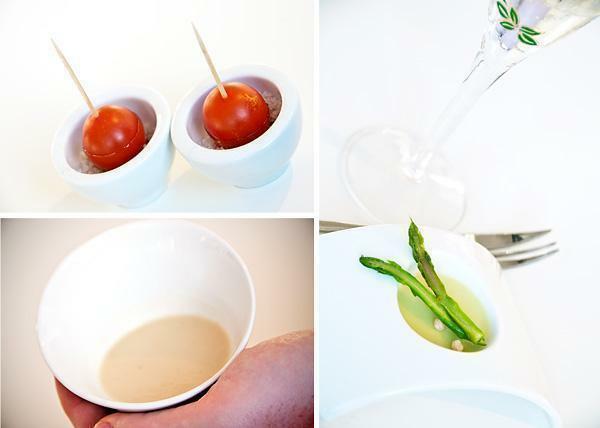 It was a classic favourite dish, elevated to new heights – fitting for a Dinner in the Sky. 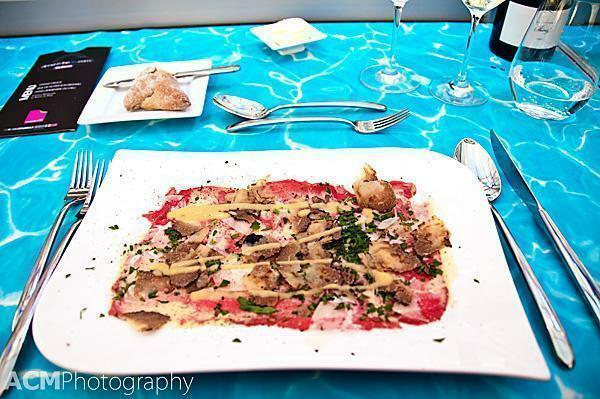 Carpaccio of ‘Blue de Prés with loads of truffle – A feast for the nose and mouth! Our main course was another example of a simple dish raised to a higher level. 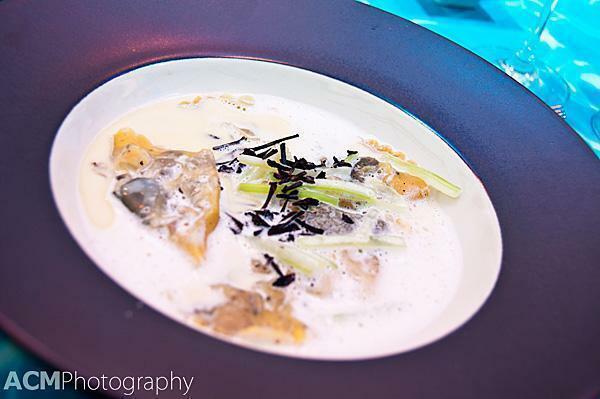 This ravioli of winter truffle in a cappuccino of truffle juice was comforting and exciting at the same time. Again the truffle dominated the dish but was set off perfectly by the silky pasta a creamy broth. In fact, I turned to Andrew and declared I’d like to take a thermos full of the truffle broth home with me. 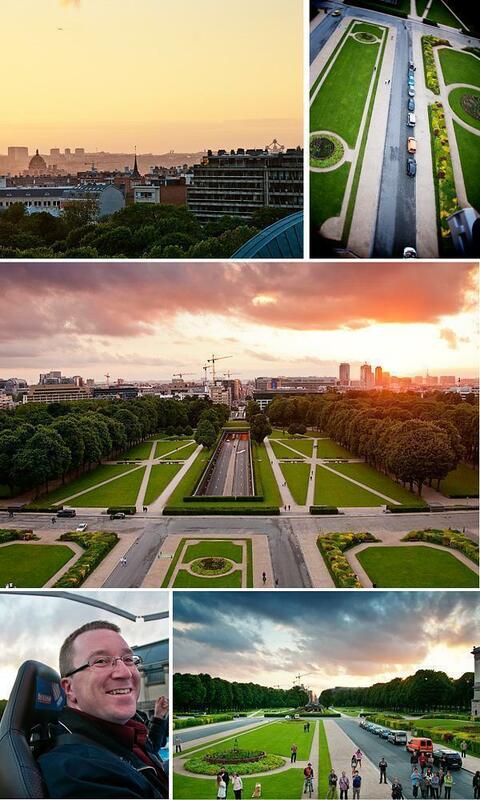 When we could tear our eyes away from the kitchen, and our plates, we were treated to a beautiful sunset over central Brussels. Throughout the meal, our chef laughed and chatted with his guests and made sure our wine glasses were filled and we were enjoying ourselves. When our pasta bowls were cleared away our chefs started to construct our desserts, while we admired the evening skyline and chatted with our fellow diners. 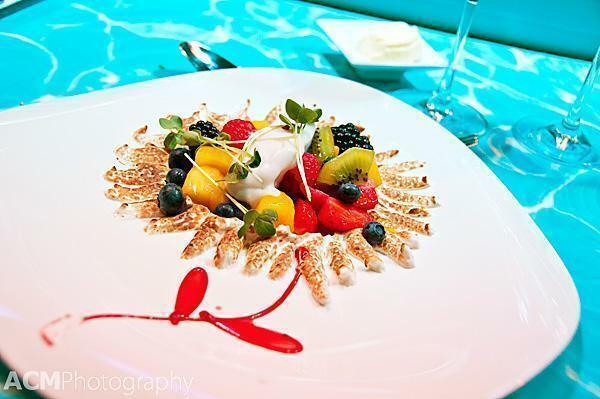 Our sweet-treat was a sunflower of meringue with fresh fruit and berries with a mango and passion fruit coulis and coconut sorbet. It looked as good as it tasted! Finally it was time to head back to solid ground and applaud our chef for a fantastic meal. Back on land, the question we keep being asked is “was it worth it?” For me it was, as an once-in-a-lifetime event. It’s not something I could afford to do again and I doubt a second time would be as good as the first. I am certainly glad Andrew convinced me to go for it. However, there are many factors left to chance: will the weather co-operate, will you get a chef and/or menu you enjoy, will the other diners be fun and interesting… We were very fortunate that all of these elements aligned in a positive way. As for Chef Ciciriello, his food and his warm personality won us over and we will definitely be making a trip to La Truffe Noir. Chef Ciciriello looks genuinely happy to serve his guests and he just won over two more! So if you are looking for an incredibly special and unique dining experience consider Dinner in the Sky and take your dining experience to new heights.